African-American women are four times more likely to die in childbirth than are their white counterparts. Their babies likewise run twice the risk of death when compared to white babies. Licensed Traditional Midwife and CPM Racha Tahani Lawler of California is working to change that, with her mission to, “Grow our community, one baby at a time.” Racha, who comes from a family of midwives, began her career early. She moved to El Paso, TX to attend the MEAC accredited midwifery school, Maternidad La Luz, and subsequently passed her NARM exam in 2004. She moved back to California in 2007 and became a California Licensed Midwife the following year. As the owner of The Community Birth Center in Los Angeles, Racha leads a team of midwives and students that provides prenatal and birth services, well woman and well child care, childbirth education, and breastfeeding education and support. Once monthly, they host “Community Free Friday,” where many of their services are provided free or at low cost. In the midst of national outrage following the deaths of Michael Brown and Eric Garner, Racha received a heart-wrenching phone call from a laboring woman, as she relates in this moving and disquieting video. 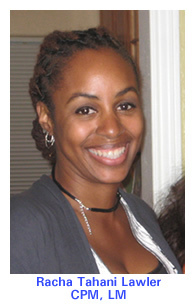 To learn more about Racha Tahani Lawler, LM, CPM, visit lacommunitybirth.com.